Afghan protests against the burning of a Qur'an in Florida entered a third day with a demonstration in a major eastern city, while the Taliban called on people to rise up, blaming government forces for any violence. Raging protests over the burning of a Qur'an at a Florida church boiled over into Afghanistan's turbulent east and south on Sunday, as the Taliban joined the chorus of condemnation. Pleas from the Western world for Afghans to show restraint in responding to the public desecration of Islam's sacred text overseas did little to stop the third day of demonstrations in the conflict-scarred country. 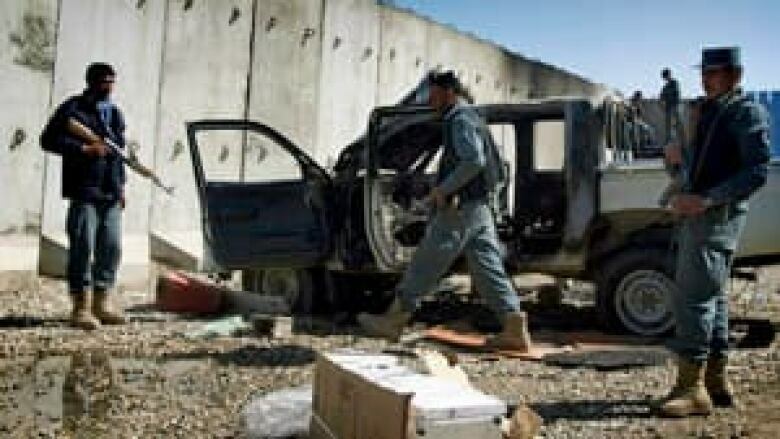 Clashes with police in Kandahar, in the south, left two officers and 18 civilians injured, provincial health director Oayum Pokhla said. As news of last month's Qur'an burning trickled to other parts of Afghanistan, rallies swept into the east for the first time, flaring up in Jalalabad, where hundreds of people blocked the main highway and set fire to an effigy of U.S. President Barack Obama. The demonstrators also shouted for U.S. troops to leave the country and stomped on a recreation of an American flag. In the previously peaceful northern city of Mazar-i-Sharif, news of last month's Florida incident enraged thousands, who overran a UN compound, killing three UN staff members and four Nepalese guards. Protests in the north and south in recent days have led to 20 deaths, The Associated Press reported. An Afghan police officer walks by a burned vehicle at the compound of the UN office in Mazar-i-Sharaf, north of Kabul, after a protest against the burning of a copy of Islam's holy book turned violent. ((Mustafa Najafizada/Associated Press))On Saturday, hundreds of people marched through Kandahar and hoisted copies of the Qur'an above their heads, then began attacking cars and businesses. Security forces opened fire and nine protesters were killed. The governor of Kandahar said 81 people were wounded and 17 people, including seven armed men, had been arrested. The Taliban released a media statement arguing that freedom of speech in the United States was no excuse for allowing "this un-Islamic act." "Afghan forces under the order of the foreign forces attacked unarmed people during the protests, killing them and arresting some, saying there were armed people among these protesters, which was not true," the Taliban said. Obama also decried both the Qur'an burning overseen by Florida Pastor Terry Jones, and the violence that erupted afterwards. He denounced the desecration of the Qur'an as "an act of extreme intolerance and bigotry," adding that it nevertheless did not justify the attacks against innocent people. Jones has said he does not consider himself to be responsible for any of the deadly events in Afghanistan. Military commander Gen. David Petraeus and the top NATO civilian representative in Afghanistan, Mark Sedwill, said that they "hope the Afghan people understand that the actions of a small number of individuals, who have been extremely disrespectful to the Holy Qur'an, are not representative of any of the countries of the international community who are in Afghanistan to help the Afghan people." The governor of Kandahar said he and the main leaders of the protests in the southern city had reached an agreement that would end the demonstrations. He did not provide details. Sher Jan Durani, a spokesman for the government of northern Balkh province, where the first riots occurred, said there were multiple armed men among the more than 20 arrested. Afghan authorities suspect insurgents infiltrated the mob. On Saturday, Foreign Affairs Minister Lawrence Cannon said the Canadian government was monitoring the wave of protests very closely, and assured that Canadian civilians working in Afghanistan were being kept safe. Calling the situation a "terrible set of circumstance," Cannon told reporters in Ottawa that "from a security perspective, our Canadian Forces as well as all the civilian personnel are provided security."